Rough bore affecting throat notes? Help! Perhaps I've made a terrible decision and I'm a little devastated now. I've recently bought a used Uebel Superior, which I really like and thought would make great advances with. Well, the horn IS lovely, but maybe I should have trusted my gut feeling and stayed with my RC. Now bear with me: I've caught myself not paying enough attention to the intonation when buying a horn once again, but when playing with the Piano, I noticed how I had to agressively lip down the Bb. On Monday, during concert band rehearsal, it was even worse. My F was so far off that I though someone played a wrong note. Even after adjusting the barrel a bit, I still had to lip it down. I was really shocked, as this has never been the case before. Both the Bb and the F aren't the most pleasant tones to play for sure, but I just found them extremely hard to control, yet extremely prone to raise their pitch when I raise my tension just a bit (up to 30 cents). This has never been the case with my other instruments. I've tried my Zoom RC barrel, which works great on this horn, and the Uebel Barrels are great on my A clarinet, so I'd rule out a Barrel problem. 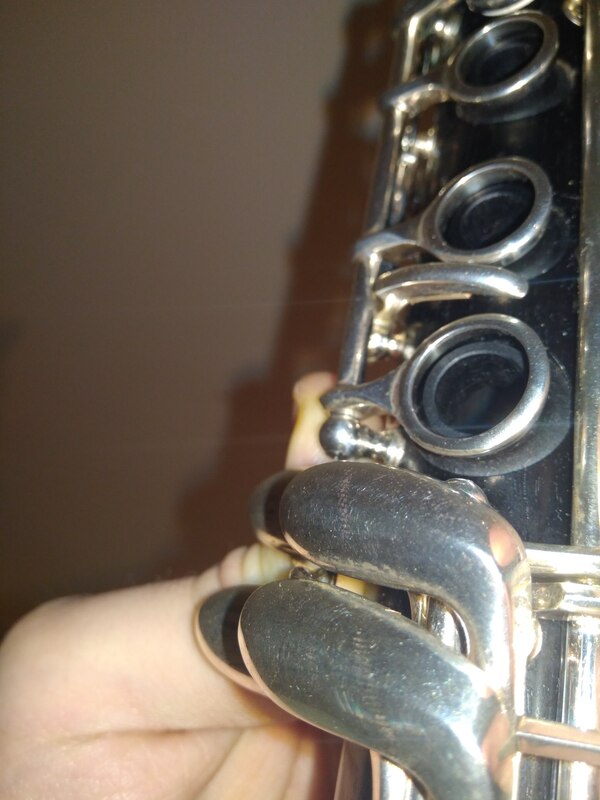 My mouthpiece has never made any problems, either - I know that it can always influence intonation negatively, but how should it, when I never had any problems with it on other clarinets so far? So, can this "erosion" affect my tone to such an extent? Re: Rough bore affecting throat notes? Help! Hmm... It looks bad and weird. Never saw this before but I think maybe the "erosion" has already somehow changed the bore of this instrument thus there is no wonder that some notes are out of tune... But maybe first use other mouthpieces to have a try as there is always a matching problem between horn and mouthpiece. so I thought. I've NEVER EVER (and this must be in caps) seen this on an instrument that was supposed to be actively used for only a year, despite being a display/test instrument before that. My Buffet is 4 years old and considering I paid 1350€ for the Uebel, it's in a better shape, I have to admit now. Thing is, I've noticed no such problem a the store when I tested a new Uebel 1-2 months ago, in fact, I'm rather sure that it performed remarkably well with throat notes. Of course, I cannot say that for sure anymore. I've only worked on one Uebel and found flaws in manufacture that I thought to be a sign of shoddy or hurried work. These problems were correctable but made me wonder a bit about their attention to detail. But would say that this was a sign of shoddy work? 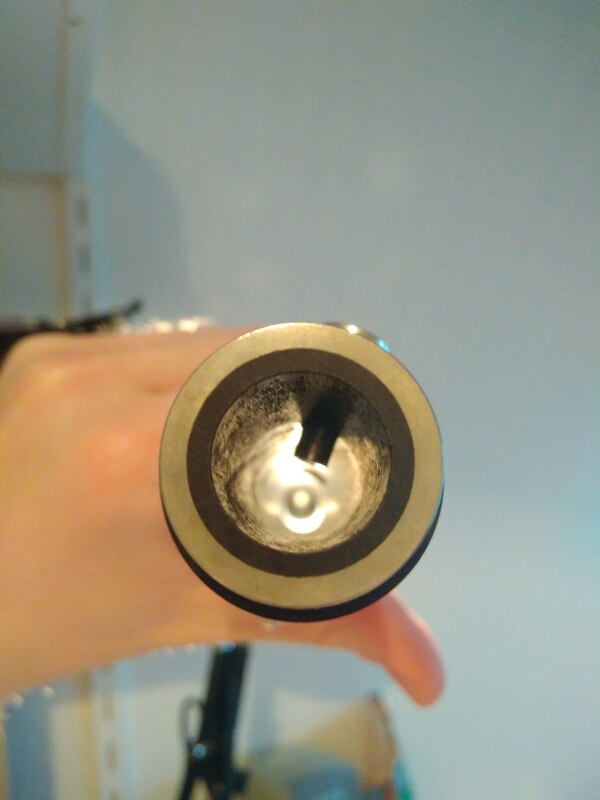 Right behind the register vent tube, there is no such "erosion" - as if it had prevented part of the acidic fluid (that is saliva???) running down! Here is a thought. However I am not sure if it can be done, because O'm from the hold school of repairing. I'd talk or attempt to talk with Guy Chadash, he's hard to get a word in when you try to talk with him. However, I would be very interestested if you could take out this tube. The horn tunes sharp. So have it rebored a shade wider to to to flatten the notes and then have a rubber sleeve put in to cover the damaged wood. Guy is doing this to his barrels, rubber sleeves. So it's worth a phone call. This will also fix any warped areas and prevent anymore damage to the horn. This is not new technology as the Buffets have the greenlines. This is just an idea. I have no idea what he would charge, if it is worth the expense, but it should last for many years. You can also consider a very hard epoxy. Epoxy is often confused with glue. It is not a glue. A plastic that comes in different forms of hardness. A good repairman can fill this damaged area, but it won't fix the horn playing sharp, so the repairman will have to do some undercutting of the holes which are sharp. If this were my horn I would do this approach. Fix the damaged area with epoxy mixed with wood shavings from an old useless clarinet and then tune the horn accordingly. I would do this first unless the damage is extensive. Thanks Bob, I've been looking into this direction. But doesn't Chadash live in the US? It's going to cost me work or money to improve an instrument, without knowing the outcome, and I've already spent 1350€! So I wrote the seller and hope it'll work out. Still can't wrap my head around how this can happen to a bore. I might not practise 6 hours a day, but even the instrument I had for about 10 years didn't look like this. Next horn will only be bought NEW, I'm fed up with how many used clarinets are treated. So it's settled, the clarinet is going back! I'll loose 50€ in process, as he requires them for his "expenses" (Nevermind me removing all keys, cleaning + polishing them and oiling the wood) but that's OK I guess, because I'm totally sure this "erosion" affects the upper joint and there are serious, yet subtle differences in intonation of the upper joint relative to the lower joint that I could only notice using a tuner while playing certain intervals. It seems like I unconsciously lipped some tones up or down during rehearsal, which fixed some issues, but produced others. Generally, any changes from the clarion to some throat notes are far off and there was no way to correct that quickly enough when playing faster passages, for me at least. No such issues with my RC. Long story short: Don't buy horns that just feel too used and listen to your gut feeling. Despite what the seller claimed, I'm 90% sure about this Superior having serious issues, so I'm rehabilitating my RC. I've attached 2 other horror images... Yeah, don't even ask about the tarnished spots, I was not going to use a polishing machine on a horn I just bought. And I don't know what kind of tool leaves these marks in the touchpieces of the C/F + Eb/G# key. I does NOT however look to me like "acid saliva" caused the bore problem. Either it wasn't finished properly at manufacture, or oiling the bore caused the wood to "rise" (I don't know the official term for this- Bassoon players talk about it though... the oiling causes micro "burrs" to lift up from the polished surface of the wood). 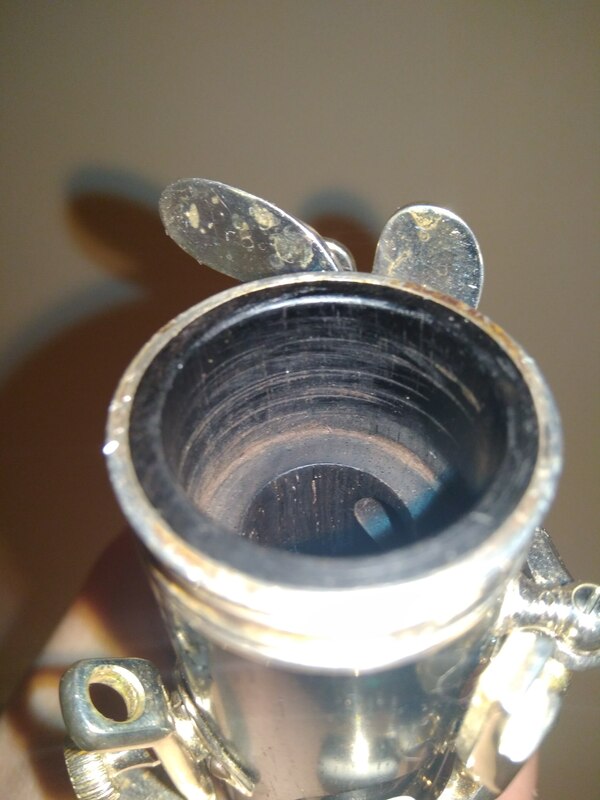 The other thing that photo (of the bore) reminds me of is an old Buffet clarinet I owned in the 1980s that had been OVER-oiled, and then played (by a smoker) without the excess oil being removed. This- over 4 or 5 years- had resulted in a film of hardned gunk about the thickness of one or two pieces of paper, primarily in the upper half of the top joint. Once this was removed the instrument played very nicely. My fault yes he lives in New York City, I didn't realize you were not in the US. It looks well used and not taken care of. As much as possible to tell from the photo (and it's not that much), I've seen clarinets with this type of rough bore. They don't have a consistent problem in intonation or tone to conclude it affects anything specific. For example at least a few clarinets with very rough bores at the top had great intonation and tone. It sounds like a problematic instrument, regardless if it was from use or (even more likely) it was always like that. Returning it is a good idea instead of start messing with it. If you were "stuck" with it then it's a different case. I just had a few professional clarinets of the same model here, all made in the last couple of years, and they varied significantly. Only one had several loose posts. One had terrible intonation on some of the throat notes (the others didn't). One had a very bad mechanical problem on more than a few keys, not far from issues normally found on cheap student clarinets. "I does NOT however look to me like "acid saliva" caused the bore problem. Either it wasn't finished properly at manufacture, or oiling the bore caused the wood to "rise" (I don't know the official term for this- Bassoon players talk about it though... the oiling causes micro "burrs" to lift up from the polished surface of the wood)." I'd have considered that a manufacturing problem too, in the first place - which is why I didn't mention it to the seller when I visited him - but if I look closely, right behind the register vent tube, the wood is undamaged, so there's a fine strip which, I suppose, the salive couldn't reach. Apart from that, I felt I had to oil the horn because the bore was already getting white. Only applied a relatively small amount of almond oil, so the horn would get a bit of humidity again. There's no saying for sure that his saliva was actually acidic and we'll never find out, but even older bores I've seen never showed this level of "erosion". BTW, the horn was bought 2 weeks ago ago. "I just had a few professional clarinets of the same model here, all made in the last couple of years, and they varied significantly. Only one had several loose posts. One had terrible intonation on some of the throat notes (the others didn't). One had a very bad mechanical problem on more than a few keys, not far from issues normally found on cheap student clarinets." What a shame, because the one I tried in store was great. Also, this one, despite all it's flaws, still beats my RC - the intonation problem was where I had to draw a line, seeing the other issues the horn had. Guess I'll end up buying a new Leitner + Kraus or something similar when I'm done studying.